After a breakthrough 2015 season Esteban Chaves aims to reinforce his credentials as a genuine general classification contender when he lines up for the Giro d'Italia in May. After a stage victory in the team time trial at the Giro d’Italia in May, the Colombian rider developed a taste for Grand Tour podiums and went on to take two individual stage victories and fifth overall at the Vuelta a Espana, followed by the victory on stage three and subsequent overall victory at the inaugural Abu Dhabi Tour. The 26-year-old lit up the climbs at the Vuelta with numerous attacks and won the hearts of fans and the respect of his rivals. Coming back from a career threatening injury, Chaves made huge inroads in 2014, his first full pro season, winning stages in the Tour de Suisse and at the Tour of California. One of the biggest objectives for the 2016 season will be the Giro d’Italia in May. Having an experienced team around him and the freedom to stage a serious assault on the general classification looks to be a challenge well met by Chaves. "I'm really looking forward to doing the Giro d'Italia this year and it's a really important objective for me and the team," he said. "I hope to be able to race at a really good level and we are targeting a result in the GC." "I really love racing in Italy and the Giro is always something very special. We're all looking forward to continue ORICA-GreenEDGE's great experiences at this amazing race." Spending six days in the red leader's jersey at the 2015 Vuelta has given Chaves invaluable experience as a team leader and as a serious general classification contender for future Grand Tours and the smaller week-long stage races. “Esteban is rapidly growing into a real GC contender and for every big race he does, he adds a lot of experience," sports director Matthew White said. "We saw him do a fantastic Vuelta last year and this year he’ll be our protected leader in the Giro." "He still has a lot of development potential in the Grand Tours, but he’s definitely ready to take another big step towards the GC. The Giro is a race that means a lot to us as a team and with Esteban in top shape, we’ll have a strong card to play over the course of three hard weeks." ORICA-GreenEDGE are no strangers to success at the Giro, winning three stages of the 2014 race including the opening team trial stage and the retention of the pink jersey going into stage three. In 2015 the team again won the opening team time trial and went on to keep the pink jersey for four days with another stage win by Michael Matthews on the third stage and three more podium finishes by the team. “Today the team worked hard to put Alberto in a good position", stated sport director Steven de Jongh. “It was a very tough day with a lot of wind of course, and in the finale Alberto was super. The result was not what we hoped for, and he was a bit isolated because some riders left him a bit earlier than we planned. It wasn't a top day but some of our riders did their work really well, that was good work. Tomorrow, we have a time trial and Alberto wants to have a good race. We will see how it goes." Il Pistolero doesn't have the suds yet to stay with the good climbers, but it's early days. Roglic and Gesink give the Volta ao Algarve queen stage colour. After two stages whose final parts turned out to be selective, the 3rd stage of the Tour de Oman left space to the sprinters. The 176.5 km from Al Sawadi Beach to Naseem Park were quite easy for the bunch, but it gave the surprise of the rain which fell on the race in the second half of the course. After few kilometers in the race, five athletes (Dehaes, Slik, Kerby, Van Goethem and Van Rooy) escaped from the bunch but their move was under the control of the bunch, which neutralized the breakaway at 10 km to the arrival. Lampre-Merida awaited the sprint, considering the good quality of the team members, but the expectation were not fulfilled. Kump was the designated sprinter for the blue-fuchsia-green team, but his lead-out train derailed at 3 km to go, so the Slovenian rider could not partecipate in the sprint. He was 24th, just behind his team mate Pibernik (23rd). Rui Costa is 6th in the general classification (10" to the leader Boasson Hagen) and he's ready to face the 4th stage, which will be probably crucial for the victory of the Tour de Oman: the stage will end on the summit of the Jabal Al Akhdar (Green Mountain), on the top of a 7 km of lenght climb with maximum gradient of 12,4% (between -3 km and -2 km to the arrival, which will be at 1435 mt of altitude). 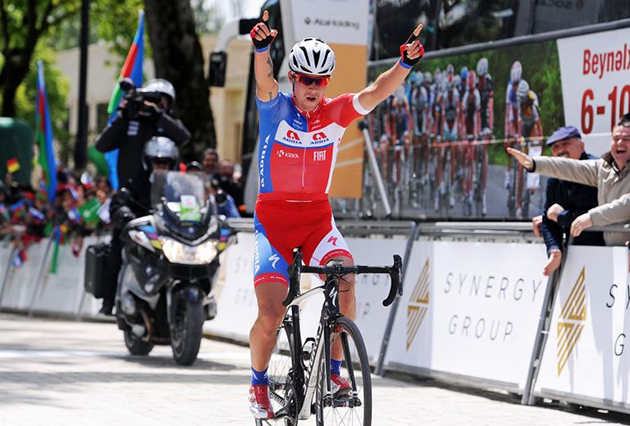 Moreno Hofland placed second in the third stage of the Tour of Oman behind Alexander Kristoff (Katusha) today. 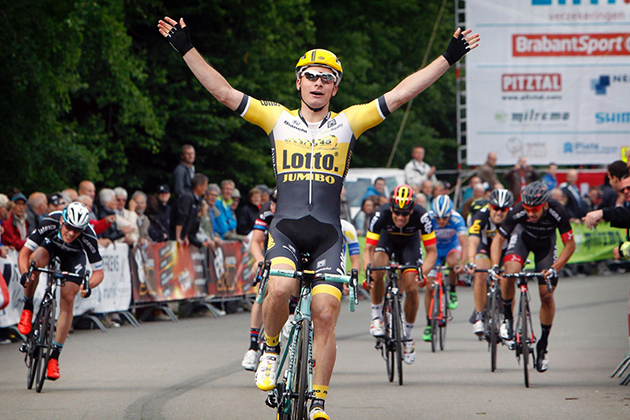 The placing was a result of Team LottoNL-Jumbo’s great lead-out to Naseem Park. In the longest stage of the Spanish race, the Italian rider of Tinkoff crossed the finish line in the leading group. 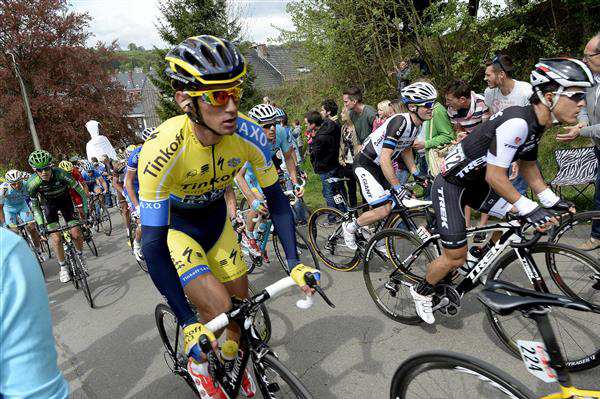 Team co-leaders, Rafal Majka and Roman Kreuziger, didn't lose time in the GC, ahead of the weekend's decisive stages. The second stage, from Palomares del Rio to Cordoba (186.3 km) was marked by an early breakaway, similar to the previous day, with four riders gaining a maximum gap of about 4 minutes on the peloton. In the front group, several teams, including Tinkoff, kept the break under control. Unfortunately, a fall, early into the stage, affected Nikolay Trusov, who suffered from road rash on his right leg. Nevertheless, the Russian rider was strong and powered up back to the peloton, working hard in the front to chase the break. With 30 km to go, a compact group caught the escapees, before the complicated finale, with a third category climb, Alto de Trassiera, 22 km from the finish line. The climb, with a 5.8% average incline, was tackled by the peloton at a steady pace, although of course it did make a selection, with a group of several dozen riders who rode past the final summit. Soon after that the riders had to face a series of twisting false flats and a fast descent to Cordoba which caused a further selection prior to the finishing sprint where unfortunately Daniele Bennati was squeezed out and therefore he was unable to sprint. The Italian rider now sits 8th in the GC and third in the Points Classification. "Today we were a bit unlucky before the descent because Oscar Gatto had a puncture and was left behind. In addition, the descent was approached at a very fast pace and the group was split," said Sport Director Bruno Cenghialta. "Kreuziger and Bennati got back in with 3.5 km to go and in the last kilometer we brought Daniele in the front positions of the group to try and do his sprint but unfortunately he was closed and couldn't carry out. However, today it went quite well because we had good feedback from the guys. As I said before, in the end we were just a little bit unlucky because we were able to do the things the way we wanted to". According to Daniele Bennati, luck wasn't on the team's side in today's stage. "Today we weren't that lucky because there were four of us in the first group, and Oscar Gatto was probably a little bit better suited than me to try and get a result. Unfortunately, he punctured in the last descent, and so in the end it was just me, Rafal and Roman in the first group. I tried to do a good sprint but I was squeezed out in the final 500 meters, so I couldn't really start sprinting. Anyway my condition, as well as Majka's, Gatto's and Kreuziger's is good, and this is very promising for the next few days". Tomorrow, the third stage, 157.9 km long, will take the peloton from Monachil to Padul. "Tomorrow, it will be another stage which, in theory, is meant to end with a final sprint, but a breakaway with six-seven riders could also get to the finish line. It will depend on weather conditions and on the wind. But a bunch sprint is very likely to happen," concluded Bruno Cenghialta.